Let's talk about window and patio door installation. 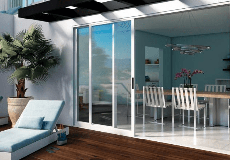 Now that you have chosen your new windows and doors, it’s time to begin installation. While replacing or purchasing new construction windows and doors is a fairly significant project, the actual installation is quick and generally requires the least amount of homeowner involvement. When you work with a local Milgard Certified Dealer, you can expect a professional job completion that generally takes just a few hours. Your Milgard Dealer will work with your schedule to set up the installation of your new windows and doors to minimize disruption of your household. Before putting in the new windows, your Milgard Dealer will take care of removing your old windows. He is trained to look for any structural or weather related issues when putting in new windows and will alert you if repairs are needed. After the installation, your dealer will clean up any mess and inspect the operation and hardware of the product. No need to worry about disposing of your old windows, your dealer will take care of that for you. Before they leave, make sure you have a copy of all receipts and product labels. Your Milgard windows and patio doors are covered under a Full Lifetime Warranty for as long as you own your home. Because of this, Milgard dealers have a long-lasting relationship with their customers and will act as a resource for any questions that might arise in the future regarding the product. Watch our video "What to Expect When Replacing Windows" for more information on what to expect in your window or door installation project.